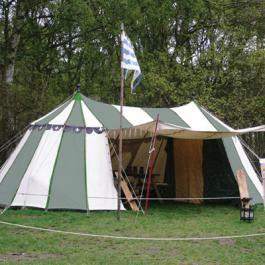 A classic design based upon the 12th century 'Agincourt' round pavilion using the central cartwheel and spoke design and including a central section to increase the size. The sizes are very similar to those of the 'Bosworth' but due to their simpler, shallower roof design these pavilion work out less expensive. They also have the option of a 'built in' awning, a useful feature at minimal extra cost.